38 degrees, sun kissed noses and windswept hair, tunes blaring, and 5 kids from the country on a 4 hour road trip to the beach; weekends don’t get much better. After a stop the cutest café in Meeniyan (The Meeniyan Store) for some ice chocolates, we trekked up to Wilsons Prom to find the inland sand dunes called The Big Drift. Even with the 4km return walk in the heat and burning feet from sand in thongs, the dunes were incredible. The cold shower at the base was just as beautiful (hehe). We drove back to Venus Bay still laughing at what we just achieved at close to 40 degrees. Arriving at the Sugar Shack was pure excitement. The CUTEST little house I had ever seen, with a swing out the front. Still overheating and sweating, we grabbed up our boards and headed to the beach, probably 1km walk from the house. 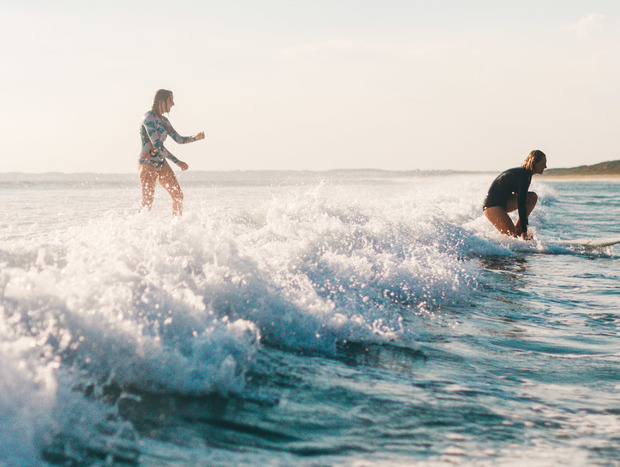 We spent the late afternoon surfing and swimming in magic light as the sun went down, then headed back to our beloved shack for a classic summer barbie. Morning sunrise put on a show over the beach. We headed back to the shack in golden light to start the day with a big breakfast with the gang, chilled out at the shack for a little while, then out for a game of cricket on the beach and another surf as the storm came rolling in.